In shallow 2-quart microwave-safe baking dish, combine potatoes, water and 1/8 teaspoon salt. Cover with vented plastic wrap and microwave on high for 5 minutes. Uncover and add green beans. Cover again and microwave on high for another 5 minutes, or until potatoes are tender. Drain liquid and allow to cool completely. Meanwhile, in a large bowl, whisk oil, vinegar, mustard, pepper and 1/4 teaspoon salt. Stir in shallot and basil. 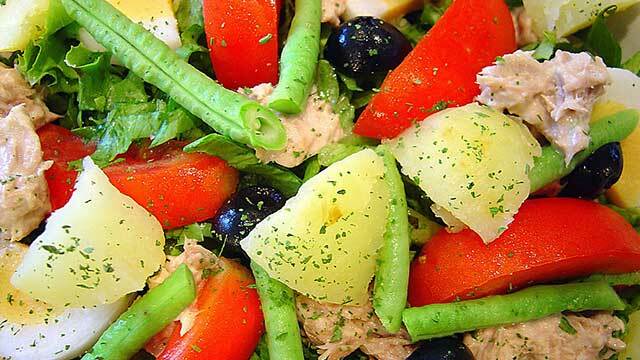 Add potatoes, green beans, radishes, olives and tuna to bowl. Gently toss to combine. Can be made ahead and refrigerated in airtight container overnight. To serve, divide lettuce among 4 plates. Top with mixture from bowl.